Once again you'll team up with a buddy through the game's cooperative story. The game promises more freedom in your decisions as well as new cooperative moves. Also new is the four player co-op Extraction mode. Army of Two: The 40th Day is a third-person shooter based in groundbreaking cooperative gameplay functionality. Sequel to the 2008 game of the same name, and featuring series heroes, Rios and Salem, in this new iteration players have a bigger playbook of features and a new arsenal of co-op moves that either player can perform at any time, opening up fresh strategies in the face of overwhelming odds. 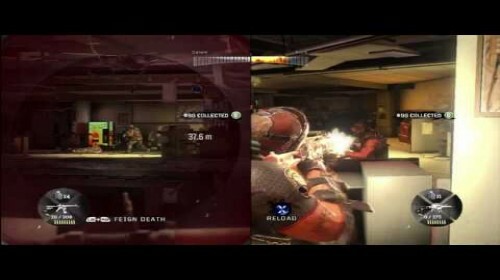 In addition, the game features advanced weapon customization and upgrade systems, as well as four explosive online multiplayer modes, each focused on unique cooperative play. Set a few years after the events of the original Army of Two game, Army of Two: The 40th Day features the continuing adventures of millitary contractors Tyson Rios and Elliot Salem. With the help of Alice Murray, their mission coordinator, they now run their own paramilitary business, known as TransWorld Operations (TWO). Working what seems to be a routine mission in Shanghai they find themselves surrounded by a force of competing private military contractors intent on running amok in the city. Will Rios and Salem survive? Will they be able to make a few bucks off a bad situation? All they have is each other to rely on. 4.04 out of 5 stars. This page contains co-op info for Army of Two: The 40th Day on the Playstation 3. All information about Army of Two: The 40th Day was correct at the time of posting. Information is subject to change. If you see any errors please email us. Page created in 0.5584 seconds.